Our blue rope, or blue polypropylene rope is suited to a wide range of applications far beyond the marine environment. 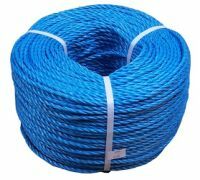 It’s resilience to weather and rot make it the first choice for homeowners, gardeners and builders, and you can find our polypropylene rope or blue rope holding down tarpaulins on HGVs, lashing nets to scaffolding and securing loads and luggage up and down the country. As one of the cheapest ropes available, polypropylene has an inherent strength that’s hard to beat, and our selection ranges from 4mm up to 32mm. 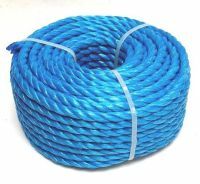 We carry a huge stock of polypropylene rope or blue rope which you can order it in 15m hanks, 30m mini coils, 220m full coils as well as a variety of reels - plus we also supply the larger diameters by the metre - just click through to the relevant section and order online now. Also known generically as ‘nylon rope’ we offer fast shipping on all the rope you see here, with commercial customers able to take advantage of Next Day Delivery to mainland UK addresses on all orders placed before 12pm.